All-inclusive starting price for a base model 2019 MINI Cooper 5 door is $27,284.00, which includes MSRP ($24,390.00), Freight/PDI ($2,375.00), retailer administration fee (up to $399.00), tire stewardship fee ($20.00), and A/C levy ($100.00). **Lease example: Selling price of a 2019 MINI Cooper 5 door is $26,365.00, which includes MSRP ($24,390.00) and Freight/PDI ($2,375.00), less credit ($400.00), at 1.99 % APR for 48 months. Monthly lease payment is $341.67 with $0.00 down payment. First month’s lease payment, security deposit of approximately one month’s payment, retailer administration fee (up to $399.00), A/C levy ($100.00), tire stewardship fee ($20.00), fees associated with PPSA ($92.76), licensing, registration and applicable taxes are extra and due on signing. Total obligation is $17,353.72 plus tax. The residual value of the vehicle at end of term is $11,463.30. Annual kilometers limited to 16,000. $0.15 per excess kilometer. Excess wear-and-tear charges may apply. 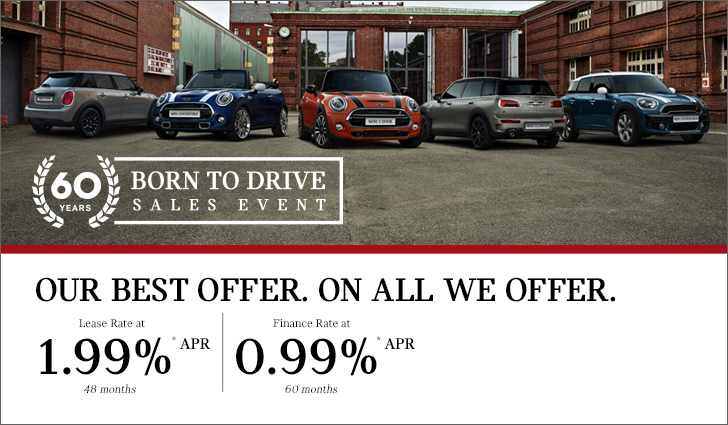 ***Finance example: Selling price of a 2019 MINI Cooper 5 door is $26,365.00, which includes MSRP ($24,390.00) and Freight/PDI ($2,375.00), less credit ($400.00), at 0.99 % APR for 60 months requires 120 bi-weekly payments of $207.95 with $0.00 down payment. Cost of borrowing is $2,643.79. Total obligation is $27,033.79. License, registration and taxes are extra and due on signing. ****MSRP starting price for a base model 2019 MINI Cooper 5 door is $24,390.00. Freight/PDI ($2,375.00), retailer administration fee (up to $399.00), tire stewardship fee ($20.00), and A/C levy ($100.00) are extra. All-inclusive starting price for a base model 2019 MINI Cooper S 5 door is $31,584.00, which includes MSRP ($28,690.00), Freight/PDI ($2,375.00), retailer administration fee (up to $399.00), tire stewardship fee ($20.00), and A/C levy ($100.00). **Lease example: Selling price of a 2019 MINI Cooper S 5 door is $30,565.00, which includes MSRP ($28,690.00) and Freight/PDI ($2,375.00), less credit ($500.00), at 1.99 % APR for 48 months. Monthly lease payment is $371.96 with $1,200.00 down payment. First month’s lease payment, security deposit of approximately one month’s payment, retailer administration fee (up to $399.00), A/C levy ($100.00), tire stewardship fee ($20.00), fees associated with PPSA ($92.76), licensing, registration and applicable taxes are extra and due on signing. Total obligation is $20,037.62 plus tax. The residual value of the vehicle at end of term is $13,197.40. Annual kilometers limited to 16,000. $0.15 per excess kilometer. Excess wear-and-tear charges may apply. ***Finance example: Selling price of a 2019 MINI Cooper S 5 door is $30,565.00, which includes MSRP ($28,690.00) and Freight/PDI ($2,375.00), less credit ($500.00), at 0.99 % APR for 60 months requires 120 bi-weekly payments of $229.25 with $1,500.00 down payment. Cost of borrowing is $2,612.28. Total obligation is $31,302.28. License, registration and taxes are extra and due on signing. ****MSRP starting price for a base model 2019 MINI Cooper S 5 door is $28,690.00. Freight/PDI ($2,375.00), retailer administration fee (up to $399.00), tire stewardship fee ($20.00), and A/C levy ($100.00) are extra. All-inclusive starting price for a base model 2019 MINI Cooper Convertible is $32,584.00, which includes MSRP ($29,690.00), Freight/PDI ($2,375.00), retailer administration fee (up to $399.00), tire stewardship fee ($20.00), and A/C levy ($100.00). **Lease example: Selling price of a 2019 MINI Cooper Convertible is $32,065.00, which includes MSRP ($29,690.00) and Freight/PDI ($2,375.00), at 1.99 % APR for 48 months. Monthly lease payment is $362.30 with $1,350.00 down payment. First month’s lease payment, security deposit of approximately one month’s payment, retailer administration fee (up to $399.00), A/C levy ($100.00), tire stewardship fee ($20.00), fees associated with PPSA ($92.76), licensing, registration and applicable taxes are extra and due on signing. Total obligation is $19,714.55 plus tax. The residual value of the vehicle at end of term is $15,141.90. Annual kilometers limited to 16,000. $0.15 per excess kilometer. Excess wear-and-tear charges may apply. ***Finance example: Selling price of a 2019 MINI Cooper Convertible is $32,065.00, which includes MSRP ($29,690.00) and Freight/PDI ($2,375.00), at 0.99 % APR for 60 months requires 120 bi-weekly payments of $233.19 with $2,500.00 down payment. Cost of borrowing is $3,124.96. Total obligation is $32,814.96. License, registration and taxes are extra and due on signing. ****MSRP starting price for a base model 2019 MINI Cooper Convertible is $29,690.00. Freight/PDI ($2,375.00), retailer administration fee (up to $399.00), tire stewardship fee ($20.00), and A/C levy ($100.00) are extra. All-inclusive starting price for a base model 2019 MINI Cooper S Convertible is $36,884.00, which includes MSRP ($33,990.00), Freight/PDI ($2,375.00), retailer administration fee (up to $399.00), tire stewardship fee ($20.00), and A/C levy ($100.00). **Lease example: Selling price of a 2019 MINI Cooper S Convertible is $36,365.00, which includes MSRP ($33,990.00) and Freight/PDI ($2,375.00), at 1.99 % APR for 48 months. Monthly lease payment is $414.03 with $1,550.00 down payment. First month’s lease payment, security deposit of approximately one month’s payment, retailer administration fee (up to $399.00), A/C levy ($100.00), tire stewardship fee ($20.00), fees associated with PPSA ($92.76), licensing, registration and applicable taxes are extra and due on signing. Total obligation is $22,449.04 plus tax. The residual value of the vehicle at end of term is $16,995.00. Annual kilometers limited to 16,000. $0.15 per excess kilometer. Excess wear-and-tear charges may apply. ***Finance example: Selling price of a 2019 MINI Cooper S Convertible is $36,365.00, which includes MSRP ($33,990.00) and Freight/PDI ($2,375.00), at 0.99 % APR for 60 months requires 120 bi-weekly payments of $272.23 with $1,850.00 down payment. Cost of borrowing is $3,250.53. Total obligation is $37,240.53. License, registration and taxes are extra and due on signing. ****MSRP starting price for a base model 2019 MINI Cooper S Convertible is $33,990.00. Freight/PDI ($2,375.00), retailer administration fee (up to $399.00), tire stewardship fee ($20.00), and A/C levy ($100.00) are extra. All-inclusive starting price for a base model 2019 MINI John Cooper Works Convertible is $44,384.00, which includes MSRP ($41,490.00), Freight/PDI ($2,375.00), retailer administration fee (up to $399.00), tire stewardship fee ($20.00), and A/C levy ($100.00). **Lease example: Selling price of a 2019 MINI John Cooper Works Convertible is $43,865.00, which includes MSRP ($41,490.00) and Freight/PDI ($2,375.00), at 1.99 % APR for 48 months. Monthly lease payment is $505.41 with $1,750.00 down payment. First month’s lease payment, security deposit of approximately one month’s payment, retailer administration fee (up to $399.00), A/C levy ($100.00), tire stewardship fee ($20.00), fees associated with PPSA ($92.76), licensing, registration and applicable taxes are extra and due on signing. Total obligation is $27,126.70 plus tax. The residual value of the vehicle at end of term is $20,330.10. Annual kilometers limited to 16,000. $0.15 per excess kilometer. Excess wear-and-tear charges may apply. ***Finance example: Selling price of a 2019 MINI John Cooper Works Convertible is $43,865.00, which includes MSRP ($41,490.00) and Freight/PDI ($2,375.00), at 0.99 % APR for 60 months requires 120 bi-weekly payments of $331.00 with $1,900.00 down payment. Cost of borrowing is $3,439.51. Total obligation is $44,929.51. License, registration and taxes are extra and due on signing. ****MSRP starting price for a base model 2019 MINI John Cooper Works Convertible is $41,490.00. Freight/PDI ($2,375.00), retailer administration fee (up to $399.00), tire stewardship fee ($20.00), and A/C levy ($100.00) are extra. All-inclusive starting price for a base model 2019 MINI Cooper Clubman ALL4 is $31,584.00, which includes MSRP ($28,690.00), Freight/PDI ($2,375.00), retailer administration fee (up to $399.00), tire stewardship fee ($20.00), and A/C levy ($100.00). **Lease example: Selling price of a 2019 MINI Cooper Clubman ALL4 is $30,565.00, which includes MSRP ($28,690.00) and Freight/PDI ($2,375.00), less credit ($500.00), at 1.99 % APR for 48 months. Monthly lease payment is $386.47 with $0.00 down payment. First month’s lease payment, security deposit of approximately one month’s payment, retailer administration fee (up to $399.00), A/C levy ($100.00), tire stewardship fee ($20.00), fees associated with PPSA ($92.76), licensing, registration and applicable taxes are extra and due on signing. Total obligation is $19,548.62 plus tax. The residual value of the vehicle at end of term is $13,771.20. Annual kilometers limited to 16,000. $0.15 per excess kilometer. Excess wear-and-tear charges may apply. ***Finance example: Selling price of a 2019 MINI Cooper Clubman ALL4 is $30,565.00, which includes MSRP ($28,690.00) and Freight/PDI ($2,375.00), less credit ($500.00), at 0.99 % APR for 60 months requires 120 bi-weekly payments of $241.08 with $0.00 down payment. Cost of borrowing is $2,650.33. Total obligation is $31,340.33. License, registration and taxes are extra and due on signing. ****MSRP starting price for a base model 2019 MINI Cooper Clubman ALL4 is $28,690.00. Freight/PDI ($2,375.00), retailer administration fee (up to $399.00), tire stewardship fee ($20.00), and A/C levy ($100.00) are extra. All-inclusive starting price for a base model 2019 MINI Cooper S Clubman ALL4 is $34,584.00, which includes MSRP ($31,690.00), Freight/PDI ($2,375.00), retailer administration fee (up to $399.00), tire stewardship fee ($20.00), and A/C levy ($100.00). **Lease example: Selling price of a 2019 MINI Cooper S Clubman ALL4 is $33,465.00, which includes MSRP ($31,690.00) and Freight/PDI ($2,375.00), less credit ($600.00), at 1.99 % APR for 48 months. Monthly lease payment is $398.83 with $999.00 down payment. First month’s lease payment, security deposit of approximately one month’s payment, retailer administration fee (up to $399.00), A/C levy ($100.00), tire stewardship fee ($20.00), fees associated with PPSA ($92.76), licensing, registration and applicable taxes are extra and due on signing. Total obligation is $21,153.60 plus tax. The residual value of the vehicle at end of term is $15,211.20. Annual kilometers limited to 16,000. $0.15 per excess kilometer. Excess wear-and-tear charges may apply. ***Finance example: Selling price of a 2019 MINI Cooper S Clubman ALL4 is $33,465.00, which includes MSRP ($31,690.00) and Freight/PDI ($2,375.00), less credit ($600.00), at 0.99 % APR for 60 months requires 120 bi-weekly payments of $247.78 with $2,050.00 down payment. Cost of borrowing is $2,571.89. Total obligation is $34,261.89. License, registration and taxes are extra and due on signing. ****MSRP starting price for a base model 2019 MINI Cooper S Clubman ALL4 is $31,690.00. Freight/PDI ($2,375.00), retailer administration fee (up to $399.00), tire stewardship fee ($20.00), and A/C levy ($100.00) are extra. All-inclusive starting price for a base model 2019 MINI John Cooper Works Clubman ALL4 is $41,084.00, which includes MSRP ($38,190.00), Freight/PDI ($2,375.00), retailer administration fee (up to $399.00), tire stewardship fee ($20.00), and A/C levy ($100.00). **Lease example: Selling price of a 2019 MINI John Cooper Works Clubman ALL4 is $39,065.00, which includes MSRP ($38,190.00) and Freight/PDI ($2,375.00), less credit ($1,500.00), at 1.99 % APR for 48 months. Monthly lease payment is $486.97 with $0.00 down payment. First month’s lease payment, security deposit of approximately one month’s payment, retailer administration fee (up to $399.00), A/C levy ($100.00), tire stewardship fee ($20.00), fees associated with PPSA ($92.76), licensing, registration and applicable taxes are extra and due on signing. Total obligation is $24,473.48 plus tax. The residual value of the vehicle at end of term is $17,949.30. Annual kilometers limited to 16,000. $0.15 per excess kilometer. Excess wear-and-tear charges may apply. ***Finance example: Selling price of a 2019 MINI John Cooper Works Clubman ALL4 is $39,065.00, which includes MSRP ($38,190.00) and Freight/PDI ($2,375.00), less credit ($1,500.00), at 0.99 % APR for 60 months requires 120 bi-weekly payments of $308.12 with $0.00 down payment. Cost of borrowing is $1,865.94. Total obligation is $40,055.94. License, registration and taxes are extra and due on signing. ****MSRP starting price for a base model 2019 MINI John Cooper Works Clubman ALL4 is $38,190.00. Freight/PDI ($2,375.00), retailer administration fee (up to $399.00), tire stewardship fee ($20.00), and A/C levy ($100.00) are extra. All-inclusive starting price for a base model 2019 MINI Cooper 3 door is $25,984.00, which includes MSRP ($23,090.00), Freight/PDI ($2,375.00), retailer administration fee (up to $399.00), tire stewardship fee ($20.00), and A/C levy ($100.00). **Lease example: Selling price of a 2019 MINI Cooper 3 door is $25,065.00, which includes MSRP ($23,090.00) and Freight/PDI ($2,375.00), less credit ($400.00), at 1.99 % APR for 48 months. Monthly lease payment is $325.74 with $0.00 down payment. First month’s lease payment, security deposit of approximately one month’s payment, retailer administration fee (up to $399.00), A/C levy ($100.00), tire stewardship fee ($20.00), fees associated with PPSA ($92.76), licensing, registration and applicable taxes are extra and due on signing. Total obligation is $16,573.06 plus tax. The residual value of the vehicle at end of term is $10,852.30. Annual kilometers limited to 16,000. $0.15 per excess kilometer. Excess wear-and-tear charges may apply. ***Finance example: Selling price of a 2019 MINI Cooper 3 door is $25,065.00, which includes MSRP ($23,090.00) and Freight/PDI ($2,375.00), less credit ($400.00), at 0.99 % APR for 60 months requires 120 bi-weekly payments of $197.70 with $0.00 down payment. Cost of borrowing is $2,610.81. Total obligation is $25,700.81. License, registration and taxes are extra and due on signing. ****MSRP starting price for a base model 2019 MINI Cooper 3 door is $23,090.00. Freight/PDI ($2,375.00), retailer administration fee (up to $399.00), tire stewardship fee ($20.00), and A/C levy ($100.00) are extra. All-inclusive starting price for a base model 2019 MINI Cooper S 3 door is $30,284.00, which includes MSRP ($27,390.00), Freight/PDI ($2,375.00), retailer administration fee (up to $399.00), tire stewardship fee ($20.00), and A/C levy ($100.00). **Lease example: Selling price of a 2019 MINI Cooper S 3 door is $29,265.00, which includes MSRP ($27,390.00) and Freight/PDI ($2,375.00), less credit ($500.00), at 1.99 % APR for 48 months. Monthly lease payment is $360.12 with $999.00 down payment. First month’s lease payment, security deposit of approximately one month’s payment, retailer administration fee (up to $399.00), A/C levy ($100.00), tire stewardship fee ($20.00), fees associated with PPSA ($92.76), licensing, registration and applicable taxes are extra and due on signing. Total obligation is $19,256.51 plus tax. The residual value of the vehicle at end of term is $12,599.40. Annual kilometers limited to 16,000. $0.15 per excess kilometer. Excess wear-and-tear charges may apply. ***Finance example: Selling price of a 2019 MINI Cooper S 3 door is $29,265.00, which includes MSRP ($27,390.00) and Freight/PDI ($2,375.00), less credit ($500.00), at 0.99 % APR for 60 months requires 120 bi-weekly payments of $218.99 with $1,500.00 down payment. Cost of borrowing is $2,579.30. Total obligation is $29,969.30. License, registration and taxes are extra and due on signing. ****MSRP starting price for a base model 2019 MINI Cooper S 3 door is $27,390.00. Freight/PDI ($2,375.00), retailer administration fee (up to $399.00), tire stewardship fee ($20.00), and A/C levy ($100.00) are extra. All-inclusive starting price for a base model 2019 MINI John Cooper Works 3 door is $37,784.00, which includes MSRP ($34,890.00), Freight/PDI ($2,375.00), retailer administration fee (up to $399.00), tire stewardship fee ($20.00), and A/C levy ($100.00). **Lease example: Selling price of a 2019 MINI John Cooper Works 3 door is $36,515.00, which includes MSRP ($34,890.00) and Freight/PDI ($2,375.00), less credit ($750.00), at 1.99 % APR for 48 months. Monthly lease payment is $455.10 with $999.00 down payment. First month’s lease payment, security deposit of approximately one month’s payment, retailer administration fee (up to $399.00), A/C levy ($100.00), tire stewardship fee ($20.00), fees associated with PPSA ($92.76), licensing, registration and applicable taxes are extra and due on signing. Total obligation is $23,910.43 plus tax. The residual value of the vehicle at end of term is $15,700.50. Annual kilometers limited to 16,000. $0.15 per excess kilometer. Excess wear-and-tear charges may apply. ***Finance example: Selling price of a 2019 MINI John Cooper Works 3 door is $36,515.00, which includes MSRP ($34,890.00) and Freight/PDI ($2,375.00), less credit ($750.00), at 0.99 % APR for 60 months requires 120 bi-weekly payments of $276.18 with $1,500.00 down payment. Cost of borrowing is $2,513.21. Total obligation is $37,403.21. License, registration and taxes are extra and due on signing. ****MSRP starting price for a base model 2019 MINI John Cooper Works 3 door is $34,890.00. Freight/PDI ($2,375.00), retailer administration fee (up to $399.00), tire stewardship fee ($20.00), and A/C levy ($100.00) are extra. **Lease example: Selling price of a 2019 MINI Cooper Countryman ALL4 is $32,965.00, which includes MSRP ($31,090.00) and Freight/PDI ($2,375.00), less credit ($500.00), at 1.99 % APR for 48 months. Monthly lease payment is $415.40 with $0.00 down payment. First month’s lease payment, security deposit of approximately one month’s payment, retailer administration fee (up to $399.00), A/C levy ($100.00), tire stewardship fee ($20.00), fees associated with PPSA ($92.76), licensing, registration and applicable taxes are extra and due on signing. Total obligation is $20,966.32 plus tax. The residual value of the vehicle at end of term is $14,923.20. Annual kilometers limited to 16,000. $0.15 per excess kilometer. Excess wear-and-tear charges may apply. ****MSRP starting price for a base model 2019 MINI Cooper Countryman ALL4 is $31,090.00. Freight/PDI ($2,375.00), retailer administration fee (up to $399.00), tire stewardship fee ($20.00), and A/C levy ($100.00) are extra. All-inclusive starting price for a base model 2019 MINI Cooper S Countryman ALL4 is $36,984.00, which includes MSRP ($34,090.00), Freight/PDI ($2,375.00), retailer administration fee (up to $399.00), tire stewardship fee ($20.00), and A/C levy ($100.00). **Lease example: Selling price of a 2019 MINI Cooper S Countryman ALL4 is $35,865.00, which includes MSRP ($34,090.00) and Freight/PDI ($2,375.00), less credit ($600.00), at 1.99 % APR for 48 months. Monthly lease payment is $427.77 with $999.00 down payment. First month’s lease payment, security deposit of approximately one month’s payment, retailer administration fee (up to $399.00), A/C levy ($100.00), tire stewardship fee ($20.00), fees associated with PPSA ($92.76), licensing, registration and applicable taxes are extra and due on signing. Total obligation is $22,571.30 plus tax. The residual value of the vehicle at end of term is $16,363.20. Annual kilometers limited to 16,000. $0.15 per excess kilometer. Excess wear-and-tear charges may apply. ***Finance example: Selling price of a 2019 MINI Cooper S Countryman ALL4 is $35,865.00, which includes MSRP ($34,090.00) and Freight/PDI ($2,375.00), less credit ($600.00), at 0.99 % APR for 60 months requires 120 bi-weekly payments of $270.26 with $1,600.00 down payment. Cost of borrowing is $2,644.18. Total obligation is $36,734.18. License, registration and taxes are extra and due on signing. ****MSRP starting price for a base model 2019 MINI Cooper S Countryman ALL4 is $34,090.00. Freight/PDI ($2,375.00), retailer administration fee (up to $399.00), tire stewardship fee ($20.00), and A/C levy ($100.00) are extra. All-inclusive starting price for a base model 2019 MINI John Cooper Works Countryman ALL4 is $42,684.00, which includes MSRP ($39,790.00), Freight/PDI ($2,375.00), retailer administration fee (up to $399.00), tire stewardship fee ($20.00), and A/C levy ($100.00). **Lease example: Selling price of a 2019 MINI John Cooper Works Countryman ALL4 is $40,665.00, which includes MSRP ($39,790.00) and Freight/PDI ($2,375.00), less credit ($1,500.00), at 1.99 % APR for 48 months. Monthly lease payment is $476.99 with $999.00 down payment. First month’s lease payment, security deposit of approximately one month’s payment, retailer administration fee (up to $399.00), A/C levy ($100.00), tire stewardship fee ($20.00), fees associated with PPSA ($92.76), licensing, registration and applicable taxes are extra and due on signing. Total obligation is $24,983.34 plus tax. The residual value of the vehicle at end of term is $19,099.20. Annual kilometers limited to 16,000. $0.15 per excess kilometer. Excess wear-and-tear charges may apply. ***Finance example: Selling price of a 2019 MINI John Cooper Works Countryman ALL4 is $40,665.00, which includes MSRP ($39,790.00) and Freight/PDI ($2,375.00), less credit ($1,500.00), at 0.99 % APR for 60 months requires 120 bi-weekly payments of $304.97 with $2,000.00 down payment. Cost of borrowing is $1,855.80. Total obligation is $41,645.80. License, registration and taxes are extra and due on signing. ****MSRP starting price for a base model 2019 MINI John Cooper Works Countryman ALL4 is $39,790.00. Freight/PDI ($2,375.00), retailer administration fee (up to $399.00), tire stewardship fee ($20.00), and A/C levy ($100.00) are extra.